One of my favorite subjects to photograph is lighthouses. There’re so many possibilities in terms of composition when shooting lighthouses. And when it comes to deciding what image or images to display its really hard to decide a favorite. 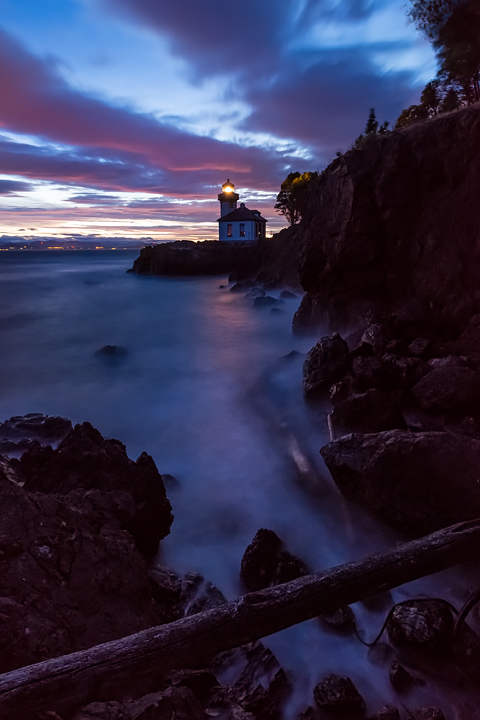 I recently came back from a trip to the San Jan Islands to shoot the Lime Kiln Lighthouse. 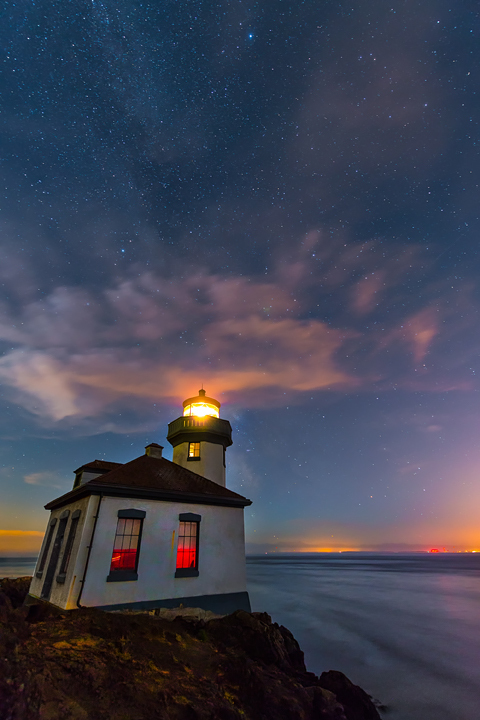 Ever since I began photography I have seen images of this lighthouse in magazines, books, and the Internet. It has always been a goal of mine to capture this mesmerizing subject in amazing conditions. I have visited this place half a dozen times but have always met with cloudy conditions. 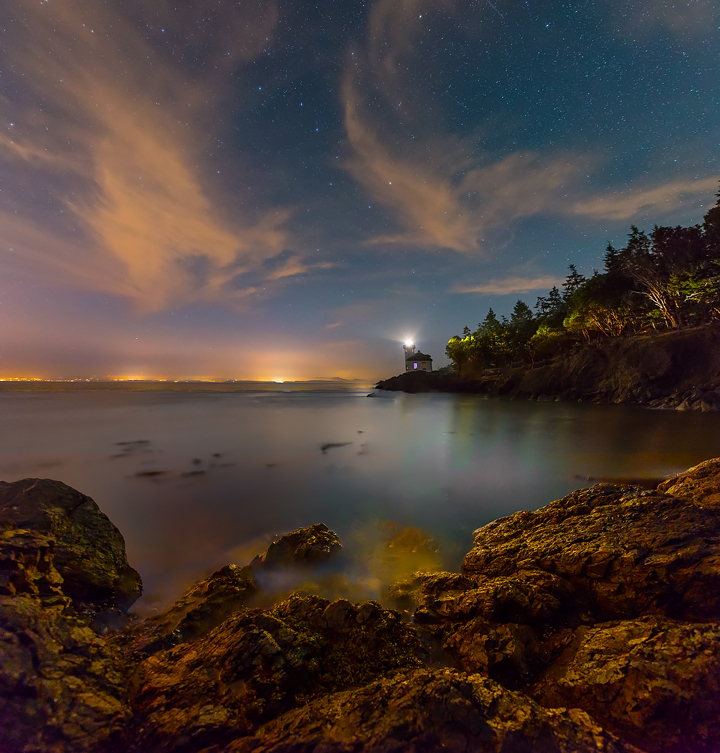 This past week I finally got some great weather and was able to shoot the lighthouse for three straight days. 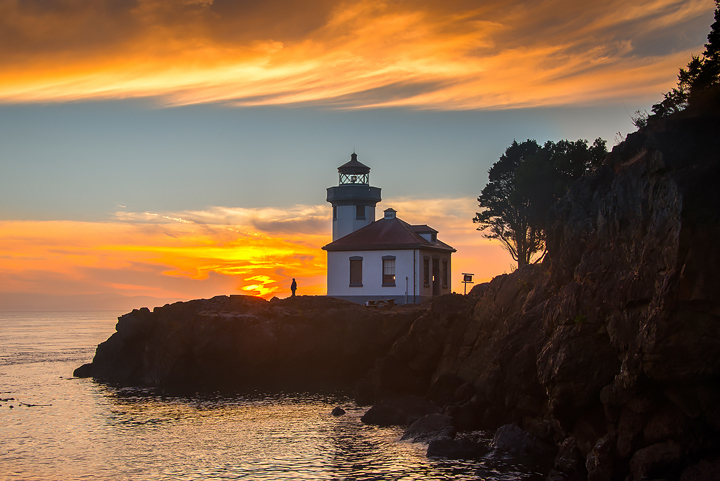 Lime Kiln Lighthouse is found on Friday Harbor, which is one of the many islands that make up the San Juan Islands in the Pacific Northwest. To get here you need to take a ferry from Anacortes, which runs only a few times a day. 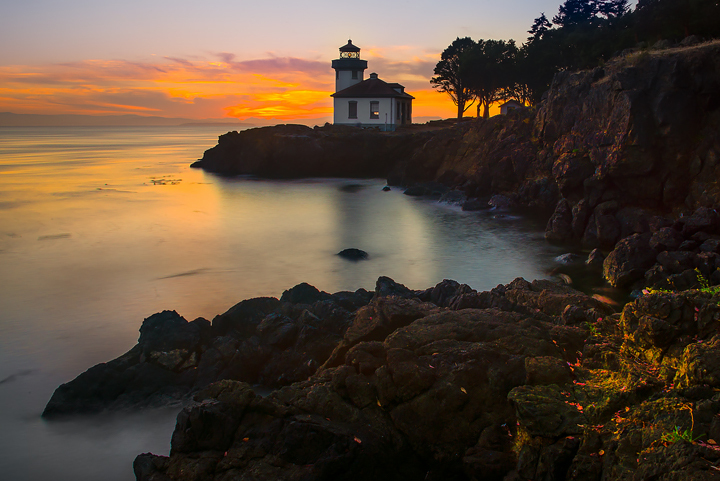 Once on the island it is a short twenty-minute drive across the island to Lime Kiln State Park. 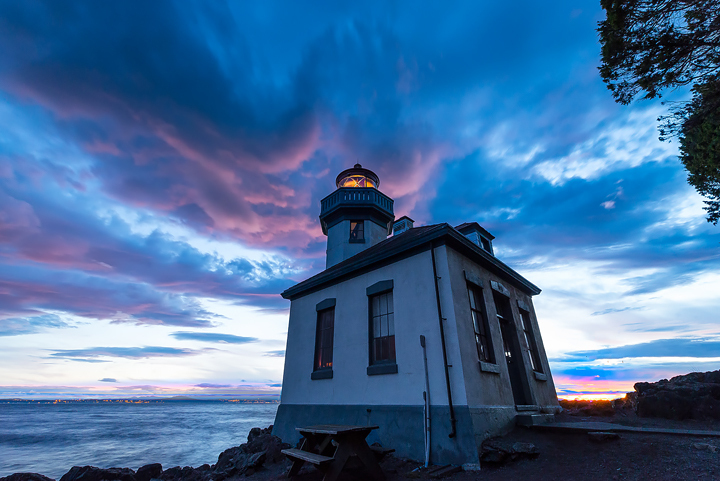 Accessing the lighthouse is easy with a short hike and can be photographed from both sides. Like most people I try to check the internet for up to the minute weather reports and time adventures with favorable conditions but for some reason the Lime Kiln Lighthouse has always alluded me and never worked out so when I made the decision to go the weather forecast was calling for partly cloudy conditions all week so I figured this was my chance. I made the drive to Anacortes from Olympia but was dealt a bad blow in traffic and it took me double the time to get there. As I pulled up to the ticket booth the lady explained I just missed the 4:45 pm and would now have to wait till 8:45 pm. This meant I would miss another opportunity to photograph this lighthouse that had been getting the better of me ever since I began photography. With sadness I began to tell me story to the lady hoping she could come up with a solution to my problem. With a little change in her voice she explained that I might just make a ferry ride to Lopez Island and then do some island hoping to catch a last minute ferry that would get me to Friday Harbor by 9pm and the lighthouse by 9:30pm. Sunset was at 9:20pm. Would that be too late and would I have to forgo this trip again and try again another day? 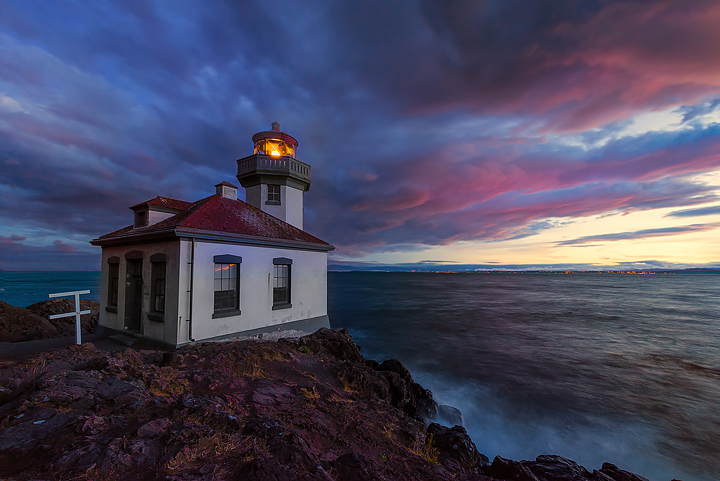 ~ by kevinmcneal on July 24, 2014. Wow Kevin! Hard to pick a favorite but I think I’d choose “Sunset Glow” or “Starry Night.” Keep up the good work and thanks for posting. Wonderful! The clouds seem to point to the lighthouse. Hi Kevin, these look great, I really like the ‘Sunset Glow’ and ‘Starry Night’ as well, although ‘Late Twilight Color’ is also very nice. Good job on getting therein time, those ferries can be fun! !